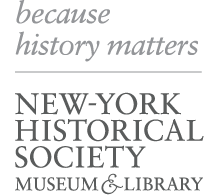 The extensive photograph collections at the New-York Historical Society are particularly strong in portraits and documentary images of New York-area buildings and street scenes from 1839 to 1945, although contemporary photography continues to be collected. This website presents photographic prints and negatives depicting New York City in the late nineteenth and early twentieth centuries. 16,000 images from this collection are also included as part of Digital Culture of Metropolitan New York, a site that offers online access to digital collections from libraries, archives, museums and historical societies located in and around New York City.